Thyristor switches are resistant to mechanical wear, operate without noise, and are capable of practically transient – free switching without inrush currents, normally associated with the electro mechanical contactor switching. An unlimited number of switching are possible, without applying significant stress to the capacitors. Capacitor life is enhanced to minimum three times of normal life due to smooth connection and disconnection. 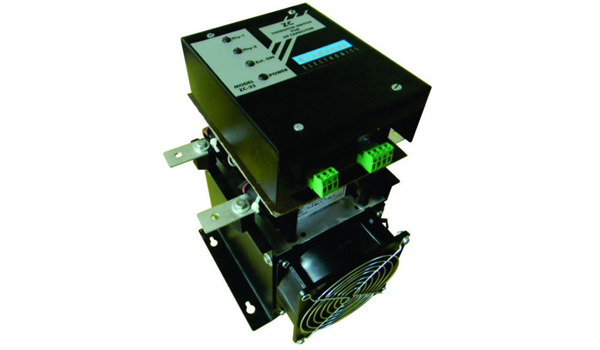 Four LED indications : Thyristor switch 1& 2 ON (Current Flow Condition), Power ON , Ext. Signal ON. Cooling Fan : ON automatically, when Switch temp rises above 60 degree Over Temperature Trip : When temp. rises above 90 degree, when fan failure occurs. External trigger signal : 3 options are as 10 to 24 VDC, 240 VAC, 415 VAC, Potential free contact (At a time only one Ext.